First to find is full of firsts and finds that you may think you have all figured out until the ultimate first to find, every nightmare any geocacher has dreamed about. If it’s a gruesome murder, then why leave behind a jar of urine or a dead dog? Casual geocachers out for their finds will stumble upon more than they bargained for in this tale of murder and revenge. If the geocachers put together the clues, will they be led right to the killer or will he catch on to their game? 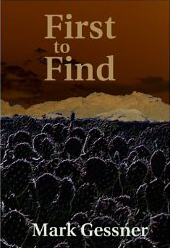 Mark Gessner opens his book First to Find with the quote “Never mess with a Geocacher — we know the best places to hide a body.” (Page 5). Gessner continues to give out great tidbits in this book, like little treasures waiting to be read. The writing style was continuously smooth, without hitches or hiccups. The flow of action was also quite smooth and progressed naturally, building up tension over time to its exciting climax. Gessner doesn’t give the reader a chance to guess the identity of the killer, but he brings us along as the two geocachers attempt to pin down who it is. We are right along with them in their hunt. The moment when the killer turns on them is the ultimate tense scene, because at that point I am so invested in their story and so completely believing of the killer’s ability that I can only think it will end poorly for Judi and Kurt. Each character was given full room for development and each was fully made alive. The killer had a larger role than I would expect, but even he was made bare by the end. Gessner was able to give me a well-rounded killer with equally well-rounded motivation, even if it wasn’t fully explained until the end. I absolutely loved the line, “The killer kept himself in good physical condition, and except for an occasional swig of Old Granddad and a recently developed taste for murder, he had no vices” (Page 147). By the end everything made sense and the puzzle pieces fit together perfectly. I understand why Gessner would give his killer the name “The Killer” until the main characters found out his identity, but I didn’t think it was necessary, since even his name didn’t mean anything until that was later further explained. This novel was published by lulu.com 07/26/2010 and is available on Amazon here.